Mr. Bradford is a Partner of the firm. He has a diverse practice and broad range of experience. He specializes in commercial litigation, eminent domain, corporate counseling, commercial transactions, and wills, trusts and estate planning. 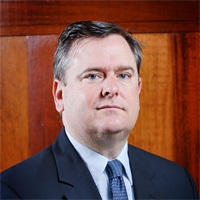 He has special expertise in complex litigation of commercial disputes involving technology and aircraft products. He serves as lead litigation counsel to the Louisiana Department of Transportation and Development in expropriation litigation across southeast Louisiana. Mr. Bradford received his B.S. degree from the University of Notre Dame and his J.D. degree from Louisiana State University Law School. He is admitted to the Louisiana Bar (1995) and all State and Federal District and Appellate Courts throughout Louisiana. Mr. Bradford is a member of the American Bar Association’s Business Section, the Louisiana Association of Defense Counsel, the Defense Research Institute, the Northshore Estate Planning Council and the Greater Covington Bar Association.